Visit our shop: We are open Monday to Friday, 08:30 to 17:00 and Saturdays, 09:00 to 16:00. Although online orders can always be placed, no orders will be despatched during the closures. 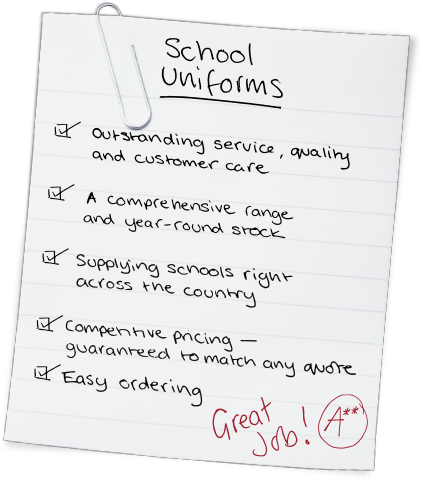 Here at Nationwide School Uniforms our aim is to provide unrivalled service and quality. The whole ethos with us is focused on operating in a way that ensures that the needs and expectations of all our customers, both parents and schools, are fully met in a manner that is second to none. We believe that convenience, exceptional service, affordable prices, durable garments and year round availability are vital. We have been badging garments for some 25 years and are extremely well known for the technical expertise we have on badging any type of garment. All badging is done in-house and being self-sufficient we have complete control over all aspects of the work including rigorous quality control at all stages of the production process. We can react to customer demand very quickly.